A series of studies highlighting the impact of global warming on the oceans also urges climate negotiators to appreciate their huge role. Warming waters, rising sea levels, ocean acidification and changing water currents caused by climate change are having devastating effects on marine environments, scientists say. But despite these effects, which researchers say will intensify and spread inland as the planet warms, oceans have not been a focus of international climate negotiations. The authors of a set of five studies on oceans and climate change in a special issue of the journal Science published Thursday hope to change that. The journal published the studies as scientists are calling for policy makers to focus on the world’s oceans during preparations for international climate negotiations in Paris that begin later this month. Oceans cover nearly three-quarters of the earth’s surface, are home to untold biodiversity and provide a large proportion of the animal protein consumed by people worldwide. Since the start of the Industrial Age, they have also absorbed roughly 25 percent of all human emissions of carbon dioxide and 80 percent to 90 percent of the associated heat increase. It remains unclear, however, how much longer the oceans can continue to serve as a carbon and heat sink and what effect the resulting increases in ocean acidity and temperature will have on marine ecosystems. In a review paper, Sydeman and colleagues assessed the impact of climate change on marine mammals, birds and fish in the world’s oceans. They found that fish, which are ectothermic, or cold-blooded, are more susceptible to climate change, but even more adaptable mammals and birds face increasing challenges and may not be able to evolve quickly enough to avoid extinction. Changes to the world’s oceans, including sea level rise, the oceans’ impact on global weather patterns and a potential decrease in the ability to absorb additional heat and carbon dioxide have implications that stretch far beyond marine environments. 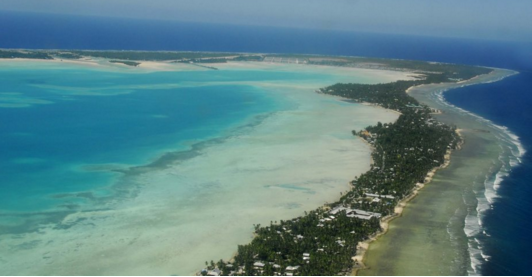 A recent study suggests that sea level rise alone could displace 187 million people by 2100. "Changes in ocean physics and ocean temperature affect the whole planetary climate system," said Edward Allison, a marine scientist at the University of Washington and the lead author of a paper examining societal impacts and responses to the changing ocean climate. "If the [carbon dioxide] buffering capacity of the oceans is altered, then that also alters the future climate," Allison said. "We are talking about the whole bio-geochemical functioning of the earth system and the whole climate system." For some, the unknown impacts of climate change on the world’s oceans are most worrisome. Scientists have a good understanding, for example, of how changes in ocean chemistry and water temperature are affecting small organisms at the bottom of the food chain, but it isn’t clear how those changes will affect other marine life. "We don’t really have that connection yet to know exactly how that might transfer up the food chain," said Carol Anne Clayson, director of the Ocean and Climate Change Institute at Woods Hole Oceanographic Institution. "It could very easily transfer up the food chain in ways that are not going to be very beneficial for much of the human population." The effects of climate change on ocean circulation are also cause for concern. "What would happen if the Gulf Stream was not quite the conveyor of warm water that it is currently? What does that mean to Europe’s climate?" Clayson asked. "These are the kinds of things that one can see when you run model simulations, and some results are rather alarming." Last month, leading scientists from the U.S. and Europe issued a consensus statement on oceans and climate change to draw attention to the impact of global warming on the marine environment and how that in turn affects the climate. "Twenty, 30 years ago, people were focused on warming, global warming, and then people started understanding this is going to affect precipitation, drought cycles, then people started understanding the regional variability," said Susan Lozier, an ocean scientist at Duke University and a co-author of the consensus statement. Now, she said, "I think there is a heightened awareness about the ocean, and considering the ocean covers three-fourths of this globe and plays a huge role in our climate system, I think we do want to alert politicians and the community at large about what is at stake." The scientists’ statement calls on participants in the UN climate talks to recognize the crucial role of oceans in the climate system, to deliver a "strong agreement with ambitious mitigation targets" for reducing greenhouse gas emissions, and to promote the role of ocean research as part of the response to climate change. In additional to the consensus statement, a group of more than 40 organizations will host an Oceans Day during the UN Climate Change Conference (known as COP21) in Paris to draw attention to the connection between climate change and the health of the world’s oceans. The condition of the oceans should play a much larger role in the entire conference, policy analysts say. "Unfortunately, going into COP21, the oceans have really been an afterthought," said Stewart Patrick, Director of the International Institutions and Global Governance Program at the Council on Foreign Relations. "Given how catastrophic [changes in the ocean] could be, it should light a fire under the leaders assembled to take dramatic steps to reduce greenhouse gases."